After exiting the aircraft, your “skydive” is broken into three general parts: freefall, canopy, and landing. For our tandem skydiving customers, so much time is spent in anticipation of the freefall portion that often canopy and landing are second thoughts. When, really, these portions should be the stars of the show. So, wondering how parachutes work then? Let’s give the parachute its moment in the spotlight – from opening to landing. We can guarantee you’ll make a lot of friends at the dropzone through skydiving, but your best friends are definitely made of fabric. You read that right, friends, plural. Lucky you – you’ve got two friends made of fabric. Skydiver under canopy showcases nicely how parachutes work. Wait. Do you mean I have two parachutes? Yes, indeed! Most people are comforted to learn that on a regular skydive you’ll have two parachutes. Per United States Parachute Association guidelines and Federal Aviation Administration regulations, the gear used for skydiving must have two parachutes. Both of these canopies are housed in the back-pack style harness you’re used to seeing on tv and in the movies. The main parachute, as the name suggests, is the primary canopy. It is the one that is deployed on every normal skydive. The back-up, if you will, is known as the reserve parachute. What’s the difference between the main + reserve parachute? Since the reserve parachute is deployed only in the event of an emergency, it is designed to open reliably, quickly, and on heading. Reserve parachutes are seven-celled, ram-air canopies (see image below). These parachutes are composed of a top and bottom sheet of nylon with fabric ribs between them. These fabric ribs create cells. Being seven-celled means the parachute is designed with an airfoil in seven segments which inflate with air through inlets at the front facing edge. The main parachute is a nine-celled, ram air canopy (see image above). Instead of seven segments, it has nine. While the main parachute should also be considered reliable, the design focus of the main parachute is for a maneuverable, exhilarating flight experience. I don’t really want to meet my reserve parachute. How likely is it that I’ll make its acquaintance? Not very. Malfunctions with modern main parachutes requiring the use of the reserve parachute are pretty rare. Even for skydivers who jump regularly, reserve deployments are unusual. But if you are in need of the reserve parachute, as a licensed sport skydiver or as a tandem skydiver, it is quite easy to utilize. 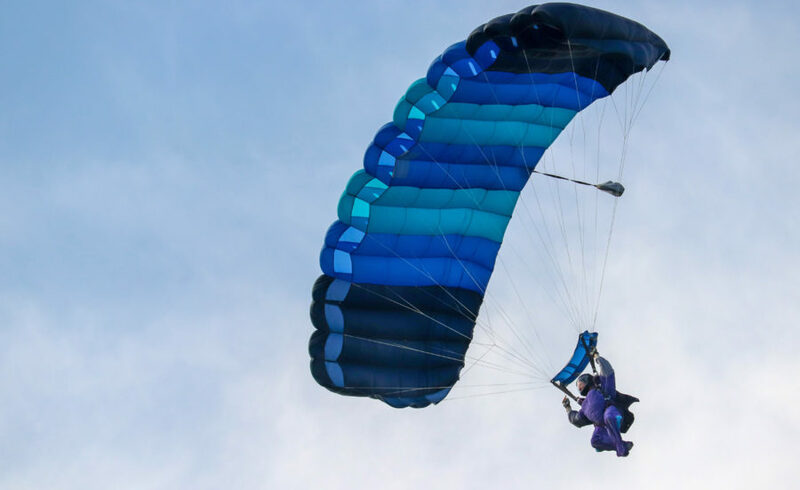 When an issue arises that requires the main parachute to be disconnected, the jumper beneath it pulls a handle on the skydiving rig to detach the troublesome canopy. Then, the skydiver pulls a handle on the other side to deploy the reserve parachute. How does it feel when the parachute opens? When the main parachute is deployed, you will feel the opening parachute slowing you down. This is to be expected when you transition from freefall to canopy flight. You’d be surprised at how gentle that transition can be. One minute you’re freefalling with your tummy to the ground and the next you’re heads up with a parachute over your head! Tandem student learns how a parachute works first hand. How in the world can I control where it goes? If you look at pictures of people under a parachute, you’ll notice a lot of lines. Certain sets of these lines do more than just connect you to the canopy. The lines at the back of the parachute allow the pilot (you or your instructor) you steer the canopy. These particular lines all converge into one “steering” line on each side. At the bottom of this line is a toggle. You turn right by pulling on the right toggle and left by pulling the left toggle down. When we are close enough to the ground for landing, we pull both toggles smoothly down, toward the back side of the parachute. This will slow the canopy and ourselves down for a safe landing speed. And that’s how parachutes work! Can’t get enough? 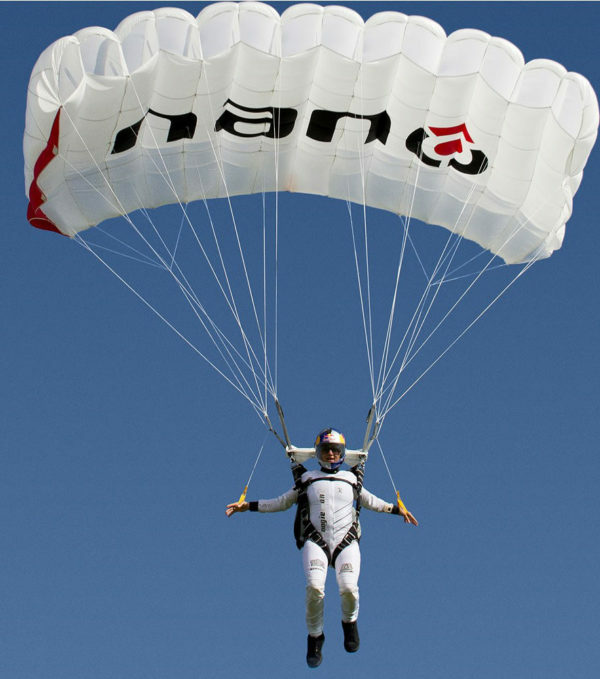 Come see parachutes and skydiving systems in action. We’d love to teach you everything we know!